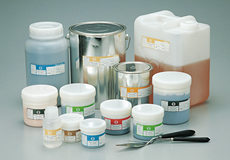 Precious metal pastes, powders, and conductive adhesives are widely used in various applications, such as circuitry and semiconductor die bonding. With our fine-tuned technology, we offer the best quality products for precision circuits. Alloy powder Ag-Pd Various precious Metal alloy powders are also available. * Indicates 50% of the particle size measured by a particle size distribution analyzer. Case Study：With delivery required in just two months, high quality, low cost thick film paste was an essential element in the success of new products.